We’re back! After a two week break, here’s another Card Hunter card preview. Mail. Yep, it’s mail. Armor that stops stuff from hurting you. You’ll notice from the grey text box and the little die icon in the lower left corner that this is another reactive card. Unlike the Block card that you saw previously, Armor doesn’t cancel a card that is targeting you. Instead, it is triggered by damage and it reacts to prevent some of that damage. In this case, it’s Armor 2, so it will soak up two points of damage from anything that tries to hurt you. Oh, and remember that the four on the die indicates that this card only triggers on a roll of 4 or more. So, about half the time you would take damage this card stops two points of that. Hmm, that doesn’t sound that great, does it? But there’s one thing about Armor that is better than a Block and that’s the fact that you return it to your hand after it triggers! So, this card can potentially sit in your hand forever, soaking up damage. Sounding a bit more useful now I hope? Wow, what’s to stop you just loading your hand with nothing but Armor and then sitting back while your opponent flails away impotently at you? Nothing really, except that you won’t have anything useful to do. Oh, any also, you can only keep two cards at the end of each round, so you won’t be able to stock up on too much Armor. 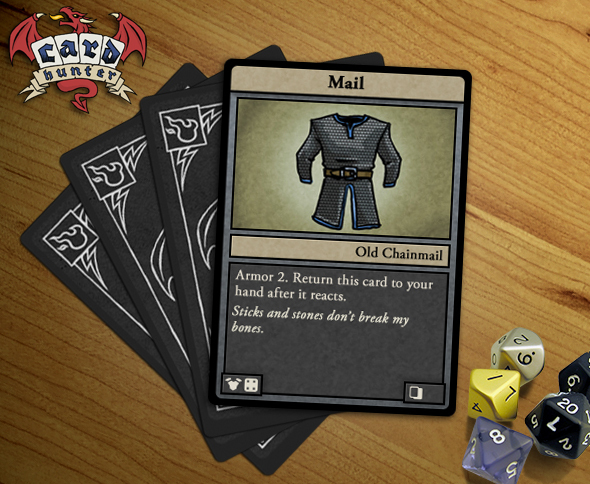 Oh, and you can really only get Armor cards into your deck by equipping armor items (like the Old Chainmail that this card comes from) so that limits how much you can take. Oh, and also, there are probably cards that deal with armor in various different ways, so it might be best not to stake your entire strategy on it. But none of that means that Armor isn’t pretty great for classes that can take it. I mean this single card can prevent a LOT of damage if you can keep it in your hand for a while. So Armor is definitely worth considering, especially if you are building a front line warrior or a tank. I promise we’ll show some more interesting and complex variants on Armor cards in the future too. It’s not quite common/uncommon. The top bar is indicative of the power level of the card. Paper ones like this are low power, bronze is more powerful.